Imagine... A home away from home beautifully landscaped courtyards, relaxing year round sun, picturesque sunsets, and complimentary cocktails by the pool. All this can be yours at the Hospitality Suite Resort in Scottsdale Arizona. This charming desert getaway continues to give each guest the royal treatment. Offering 210 Jr. King and One-Bedroom Suites with full kitchens in each room. Strategically designed to pamper the avid sun worshiper, with 3 year-round pools conveniently accessible from each Suite. 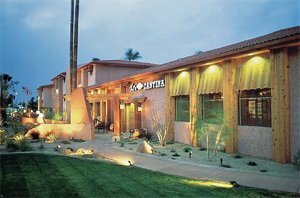 Conveniently located in the Northeast Valley of the Phoenix Metro area at the border of Scottsdale and Tempe, 5 miles from Sky Harbor Airport. Perfectly situated within the border of Scottsdale near the 202 and 101 Freeways. Suites include king or twin beds. Based on availability.